This novel reminded me of THE IRON KING by Julie Kagawa on numerous occasions. However, it is not a copy, by any means. I enjoyed Wylie’s take on the fantastical creatures we know as Faeries and Elves. Kaeleigh has just turned eighteen, a girl just becoming a woman and still trying to find herself. She has always been a little bit different than everyone else, but not in a way that could easily be discerned, not even by herself. She soon finds out that not everything is what it seems, and her long time best friends are hiding things too. Daegan is a Faerie, one taken in when he had no home, and one of the best warriors the tribe has. A possible threat reaches the ears of the leaders, and Daegan is given the mission to go find this new power and bring it back. His task proves to be harder than it originally sounded, because his emotions end up getting tangled every which way. His loyalty is tested, and well as some budding feelings for his charge. SILENT ORCHIDS starts out with a bunch of interesting terminology and history being thrown at you. I felt I needed to take notes, all of the info bordered on what you might read in an epic fantasy. While it was all intriguing and fascinating, it could be a bit overwhelming so I was grateful we have our main character, Kaeleigh, learning things along with us! Alandria, the realm that all these creatures preside in, is so rich in history and detail. I hope we get to see more of it in the next book because I loved how it was described in SILENT ORCHIDS. The world building in this was a major positive in my book. This novel did not have the dreaded insta-love, but it did have the “gorgeous guy who stalks the main character but in reality really wants to help her” situation. This was really the main negative in SILENT ORCHIDS. While I did enjoy the banter between them and how naive Daegan was to the real world, I felt Kayleigh should have thought him more of a threat. The ending seemed a bit abrupt, there is a definite cliffhanger. I am definitely itching to see what happens next, and I will definitely be reading the sequel. I recommend this to fans of fantasy and those who enjoy reading about the more whimsical creatures in fiction. Morgan Wylie has been writing on and off throughout her growing up years, but started seriously working on her first novel in the Spring of 2009. 7 months pregnant with her first child, she didn’t start off with a lot of focused writing time. But Morgan had an epiphany, if you will, and the story flashed before her so she began to write. And she’s still writing. Her debut Young Adult fantasy, SILENT ORCHIDS, will be out this summer. 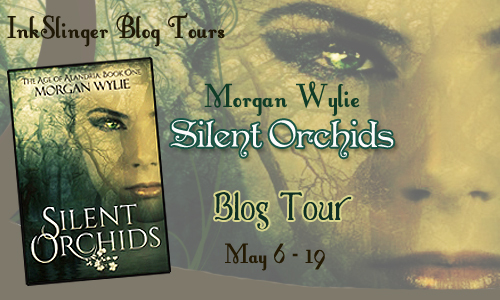 We are so excited to have the awesome Morgan Wylie, author of SILENT ORCHIDS, here to answer a few questions as part of the InkSlinger Blog Tour! Thanks for participating, Morgan! Did you always know that you wanted to write a fantasy novel? Yes, and no. Lol. When I was younger I loved fantasy and would read and write fantasy stories. Then as I got older I went through a non-fiction phase (not entirely my choice, but that’s another story) and I tried writing some non-fiction but it was dry and lifeless for me. Then about 6-7 years ago now, I started reading fiction again mainly fantasy and anything paranormal. I read and I read and I read. Probably like many others, I have Twilight and Harry Potter to thank for that. And I started dreaming about writing again. Fantasy was a natural fit for me. I LOVE it. Was there anything that directly inspired SILENT ORCHIDS? Actually, yes, but it’s pretty random and rather indirect: I was 7 months pregnant with my daughter and watching TV in the Spring of ’09. A commercial came on (I can’t remember which one) and it had an orchid in it. Then, and as cliché as it sounds, the whole story flashed before my mind’s eye (granted it’s evolved a bit since then). I couldn’t get it out of my head and I haven’t been able to stop writing it since. How would you compare yourself to the main character, Kaeleigh? Kaeleigh is a strong, independent, somewhat reserved character. She’s gone through quite a bit growing up and is trying to understand who she is and where she belongs. I feel like in those regards, Kaeleigh and I share quite a bit although via different experiences. I did not write her based on me or my life, but there are parallels. I’d like to believe that things I have gone through and choices I’ve made have forged in me an inner strength similar to how Kaeleigh grows in the book. I’m pretty independent (ok, stubborn might be a good word too) and am pretty private and reserved with those who don’t know me. And even beginning this journey, writing this book, I feel like I have truly found myself and grown as a person and I’m excited to see how we both continue to grow and change into who we are to be throughout this process. When you first sat down to write SILENT ORCHIDS what was one thing you knew you wanted to have in your story? Ooo, good question. Orchids. Had to have some orchids ;) Also, I knew I wanted a strong female lead. I love fantasy and paranormal so I knew I wanted characters that would fit, but it was hard to choose so I decided to create a world with several races so I wouldn’t have to choose J Oh wait, that was more than one, oops. Have you ever ended up hating something you wrote? Oh boy, YES! I’ve scratched multiple chapters before and questioned my writing on the whole. Also, sometimes, when I read back over something I wrote a while back I’ll say “What was I even talking about?” Actually I did that recently with book 2, lol no idea where I was going. If you had to give one piece of advice to aspiring writers to overcome this feeling, what would it be? DON’T QUIT!! It can be very overwhelming and discouraging at times. Just keep writing. Each time I scrapped something—and sometimes it was even something I liked, but just didn’t fit—something new and better and rightwould take its place. I’d also encourage them to find someone that can be an encouragement to them as a writer and someone that will challenge them. Yeah, I didn’t have any real qualms with the romance. Definitely, plus it just builds suspense! I’m not a huge fan of that either, but I was just glad it wasn’t insta-love! Thank you! Ash wasn’t too bad because he did have a mission, like you mentioned. True that it is fictional but sometimes I wish the heroines would show a little more common sense in dealing with stalkers-they aren’t all hot guys waiting to whisk you away to a fantastical land.